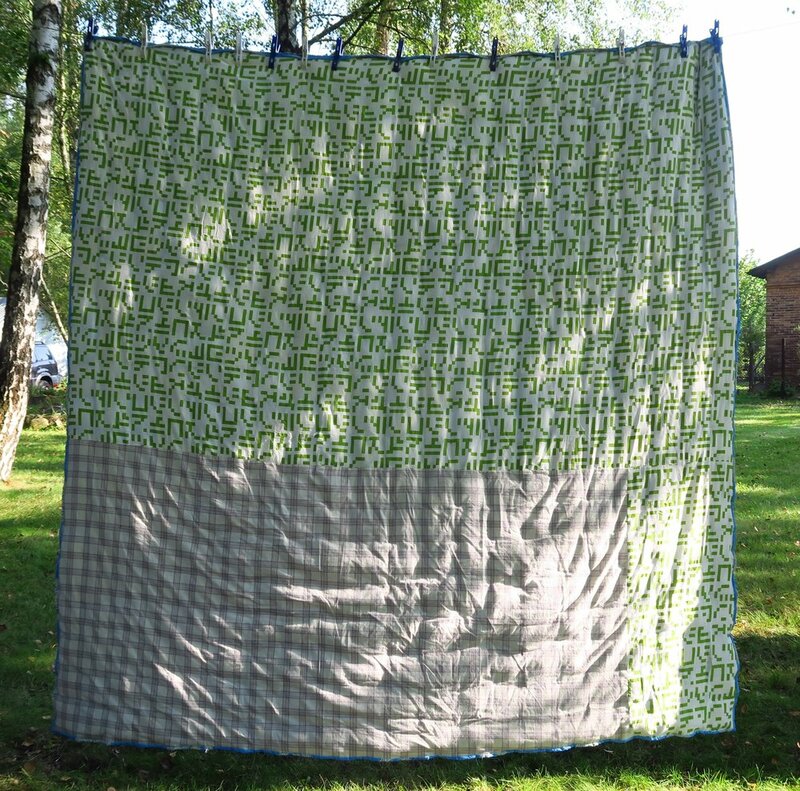 I finished my biscuit/puff quilt made out of upcycleds. This is my first and last such quilts! It’s heavy, slow, tedious and not very practical! Hence, I won’t be making another one. At least not until long after I’ve forgotten about making this one. Because this is the type of project that it is, I didn’t write up a pattern for it. If you want to know how I made my individual squares, just go back and read the other post as talked about above. I don’t think I’ve made a quilt that was less fun for me than this one. I thought it would be an adventure, but after making about 50 of these puffs, I could see tedium setting in. I needed 441 of them and I truly had to force myself to make them! In theory, this quilt measures about 94.5" x 94.5”. I am pretty sure it is a bit smaller than that, though since I probably used a bit more than 1/4” seams. I think it is more like 90”x90”. I wrote about making the top here and in that post I put quite a few pictures of how I made my puffs on it, so I won’t do that again. You can just read what I already wrote. 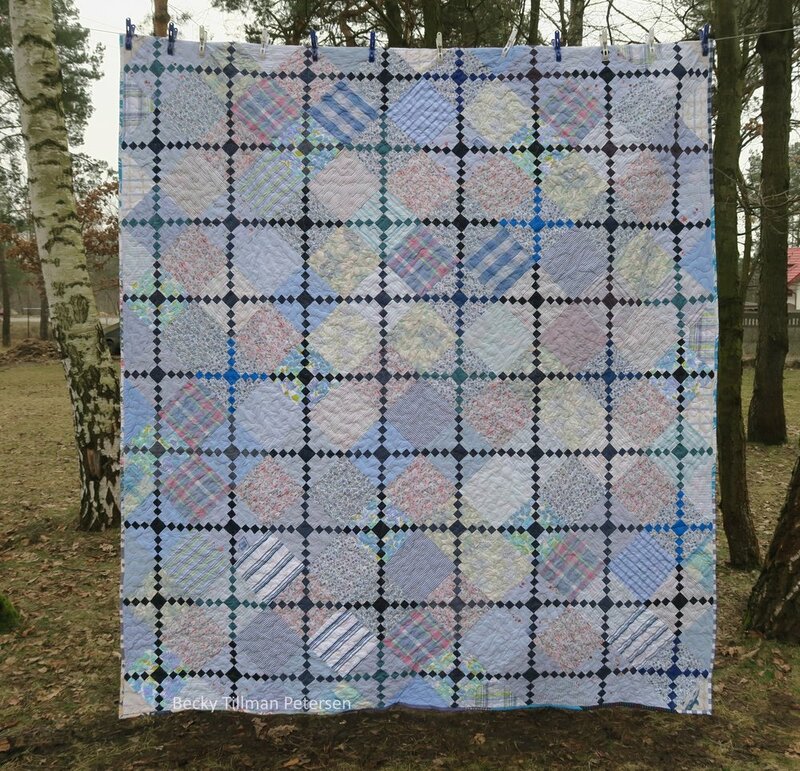 The backing is made from upcycled materials as are all the upcycled blues series quilts. In order to quilt this, I used cotton perle thread/yarn and a curved needle and went puff by puff and tied it. It seemed to take a long time. But that’s partially because it is a large quilt. Because the quilt was like it was, I couldn’t even put it under the machine to stitch a sort of stitch to quilt it. So I tied it. I didn’t really see that I had a choice. I also have not washed this one. I don’t think it will fit into my machine. I live in Europe and our machines are smaller than most American models. Maybe when we upgrade to a larger machine it might fit in it. It would be very warm. 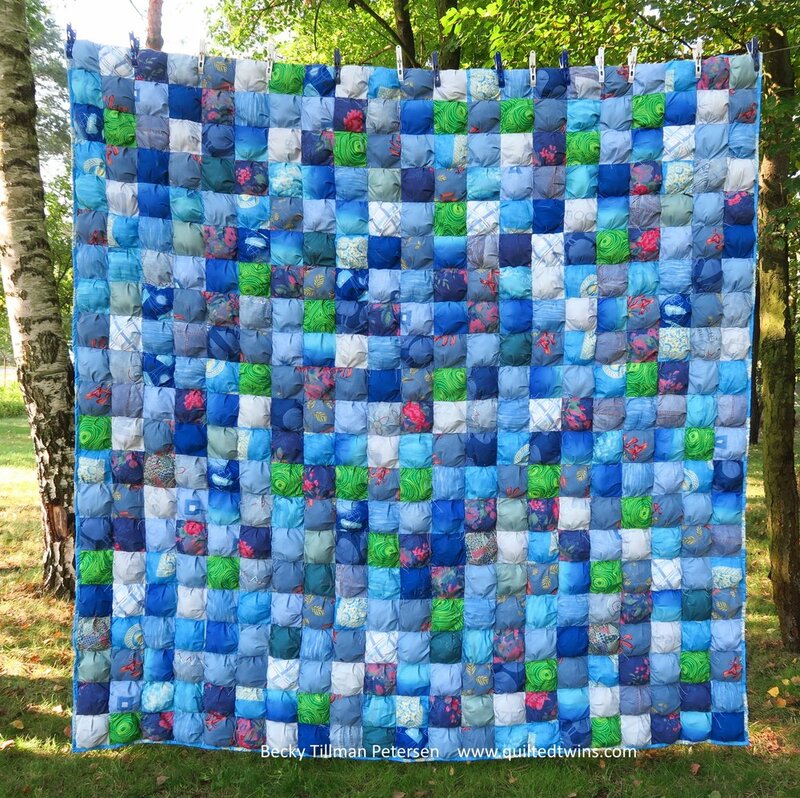 Each one of those puffs is filled with polyester fiberfill - leftover batting from the previous upcycled blues quilts I have made in this series so far. Don’t forget, you can keep up with the upcycled blues project here. I am trying to keep the pictures updated If your life gets busy and you don’t have time to read at the blog, but want to go check it out, feel free to do so! One note - while I don’t have any desire to make another one of these, I’m glad I made this one. Quite possibly if I had made a much smaller one such as a baby size, my experience would have been considerably more enjoyable! If you have a hankering to try one of these, by all means, go for it! They aren’t hard. the only thing hard about this was throwing around the weight of the quilt as I was working on it after I had made the sections of 7x7 puffs sewn together. It wasn’t hard. Not at all. It was tedious. I really did have to force myself to work on it there for a while - I made myself make 20 blocks a day, or even 10…just to make some progress. I was quite content with procrastinating about it until I made myself work on it! And it’s heavy! Did I mention that it is heavy? Yes. I just weighed it. It weighs 10.5 lbs (4.8 kg)!!! Just for comparison, another one is 6 lbs or 2.65 kg! This one - I call it Simple Chains. And that’s what’s been happening in my sewing room! Make sure you check out what my sis has for you over in the store! She’s working hard to make you happy and to keep you in fabric at prices you can afford!